Baseline London by Graeme Miller at The Barbican Car Park 5, originally uploaded by moleitau. Batter-up, originally uploaded by moleitau. Passed away recently. Very sad news, and a real shock. I met Martin a few years ago when I was working at Nokia, and after some initial crossing of swords (who was this marketing dude, and what did he want with design?) we found ourselves getting on famously. Martin was always ready for an unscheduled adventure. The picture above is from a business trip to New York when we snuck away from day-long meetings to go and face 75mph baseballs from the batting net machines on Chelsea Piers. Instead of the ‘traditional’ dinner after a long marketing board meeting, he took a bunch of (fairly-traditional) Nokia marketing people to the BFI screening room to watch a documentary (“Dark Days”) about people living in tunnels beneath Manhattan. Martin was a man in love with human culture – all of it, and he loved being involved in making it – advertising and marketing being the vehicle he used to do so (mostly). I wish I’d had longer to enjoy watching him do it. 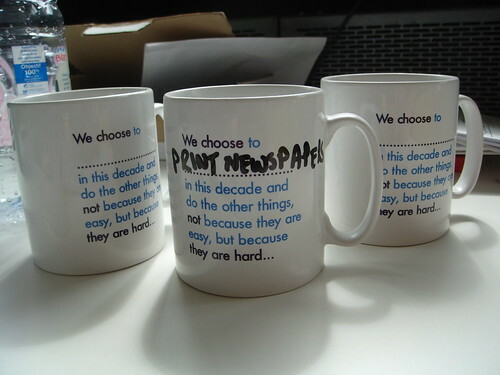 mugs, originally uploaded by russelldavies. Now available…, originally uploaded by moleitau. As I said previously, I mainly make these t-shirts with spreadshirt so I can have them for myself, but if you’d like one too they’ve available at http://moleitau.spreadshirt.com. Retool GM for Maglev! YEAH!, originally uploaded by moleitau. From a trip to NYC in 2005. What if they’d listened to these guys? "Always 5, acting as 1" in Blue, originally uploaded by moleitau. I’ve had a habit for a long time of putting a throwaway thought onto a t-shirt. Usually they languish in a flickr set called “Imaginary T-Shirts” but sometimes they become real… Especially if I want to wear them.